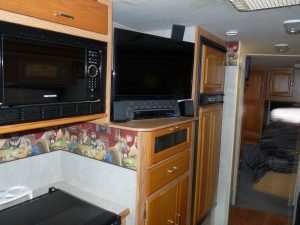 Looking for a professional RV detailer? 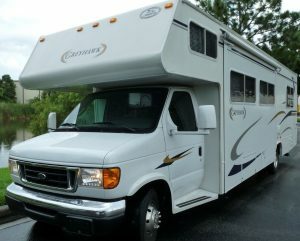 Look no further, we are Tampa Bay’s professional RV detailing service! Affordable, dependable and ready to make your recreational vehicle look like new! We offer full-service RV detailing, from pick-up to delivery. With more than 30 years of motor vehicle expertise in Tampa Bay, our detailing team can handle anything from a basic wash, to a polish and wax, as well as complete remodeling and restoration of your RV. RV’s, like other vehicles, need to be washed and waxed regularly to keep it looking its best, especially in the hot Florida sun. Oxidation and sun damage occurs quickly when left out in the elements. Due to the sheer size of recreational vehicles, regular waxing is a difficult, virtually impossible task for most owners. Most RV owners don’t have the necessary tools, equipment, training and safety mechanisms for the task, or the amount of time it takes to complete it properly. Face it, would you rather be driving the RV or cleaning and waxing it for days? Our clients are always amazed at how efficiently we are able to make their RV shiny and beautiful again, on the inside and the outside! We recommend regular RV washing, to remove bugs and roadway debris, which can ultimately destroy the sealant and paint if left to bake in the hot sun. Washing before and after use ensures your recreational vehicle exterior will remain in good condition and extend the life of the paint by reducing oxidation which makes it dull and chalky. Regular washing extends the life of your investment. Interior cleaning services are also recommended both before and after a trip, so your motorcoach is always fresh and ready to go! Whether you’re looking to replace your flooring, upholstery, TV’s and video equipment, or have a list of broken or interior items that just don’t work, we can help. Our team understands owning a recreational vehicle is of great enjoyment, when everything is clean and in working order. We provide a detailed estimate of repairs prior to beginning the job, so there’s never any surprises. We are happy to come and pick up your RV, or you can bring it to us. We also offer full-service car, motorcycle, boat and truck detailing services. We offer a variety of RV washing and detailing packages, so please give us a call at 727-409-2628 or contact us online for a custom quote. Located in Clearwater, we serve all of Tampa Bay. Licensed and insured. We accept all major credit cards for your convenience.